Should You Eat if It Is Late & You Are Hungry? Whether you're dieting, trying to maintain or gain weight or just living a healthy lifestyle, you probably have more questions than answers about diet-related issues. A common one is "If I'm hungry at night, should I eat?" The answer is "Yes. And no." Late night hunger can lead to unhealthy snacking, which can sabotage your diet and your health. But, a low-calorie, high-protein snack, or one containing complex carbohydrates, can help you sleep better and keep you from lunging for the doughnuts when you wake up. The number of calories you take in at any given meal does not change depending on what time you have it, according to Columbia University. A 1,200-calorie meal at 6 p.m. is still a 1,200 calorie meal if you have it at 8 p.m. or 10 p.m. The idea that calories consumed later at night aren't burned because you're sleeping is a myth. All bodily functions, such as breathing and heart pumping, continue in your sleep, and all, even snoring, need to be fueled by the burning of calories. There's also evidence that fasting for as little as 12 hours can have a beneficial effect on your overall health. A study published in the October 2018 issue of The BMJ found that therapeutic fasting lowered the need for insulin, aided weight loss and helped manage blood sugar levels in some people. This does not mean that you should never eat at night, but if your snacks before bed are more recreational than hunger-driven, there's good reason to change this habit. Common sense should tell you to avoid pizza, banana splits and double chili cheeseburgers before bed, but what does that leave? The experts at Ohio State University advise eating breakfast, because people who skip it tend to eat more calories during the day. Rush University Medical Center reminds you that the more nutritious and filling your daytime meals, the less likely you are to find yourself reaching for cold Chinese food at midnight. If you must snack before bed, choose complex carbs such as whole-grain bread with nut butter or mashed avocado. Low-fat yogurt is satisfying and creamy, and you can't go wrong with an apple or a pear and a slice of cheese. Unsalted nuts are also a healthy choice, either alone or chopped and sprinkled over nonfat cottage cheese and drizzled with honey. If ice cream is your go-to bedtime snack, that's fine. But have a scoop instead of the whole pint. Create a meal plan for each day so you can ensure you're getting enough calories and nutrients and that they're spread over small meals and snacks throughout the day. Make an electronic list, a paper list or a snack night pdf that can be updated and printed out so you have a plan in place. 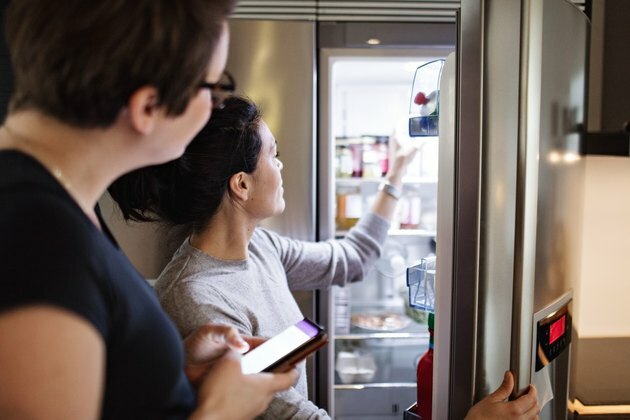 According to the experts at Colorado State University, another way to avoid unwise late-night snacking is to move the healthiest choices to the front of the refrigerator or leave a non-perishable snack on the counter or table before a night out. This allows late-night snacking and still saves you from grabbing empty calories. Ohio State University - Wexner Medical Center: Can Nighttime Eating Sabotage Weight-Loss Efforts? Columbia University - Go Ask Alice! : Eating at Night = Weight Gain - Myth or Fact? Can You Lose Weight If You Stop Eating After 6 PM? How to Lose Weight by Not Eating After 5 P.M.
Can You Eat Whole Grain Cereal at Night?